English Heritage is once again welcoming people to Stonehenge to celebrate the 2013 Summer Solstice. Sunrise will occur at 4.52am on Friday 21 June, on what is the longest day of the year. Over the night, people have the opportunity to celebrate the Solstice and this includes spontaneous drumming within the stone circle, playing of acoustic instruments and dancing in the performance area. 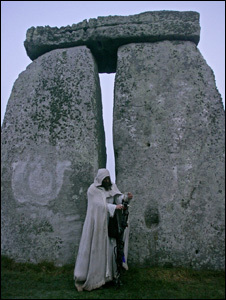 There will be a number of druid, pagan and other spiritual ceremonies throughout the night and especially at sunset and sunrise at various places around the monument, in particular the Heel Stone. For an idea of what to expect, view the Stonehenge Summer Solstice 2012 photo gallery. Stonehenge will be open from 7pm on Thursday 20 June to 8am on Friday 21 June. The solstice car park, just off the A344 near Airman’s Corner, will open from 7pm on Thursday 20 June, with last admission at 6am on Friday 21 June.